The No. 33 Rheem/Menard’s Chevy has a first-time pilot for this weekend’s Saturday night event. Ryan Gifford, a participant in NASCAR’s Drive for Diversity program, makes his first-ever Nationwide Series start for Richard Childress Racing. He will also compete in the K&N Pro Series East race for Rev Racing on Friday night. Iowa Speedway seemed a natural choice for a debut NNS run due to his experience there. Currently in his fourth full-time year in the K&N Series, Gifford has five starts at the track under his belt. 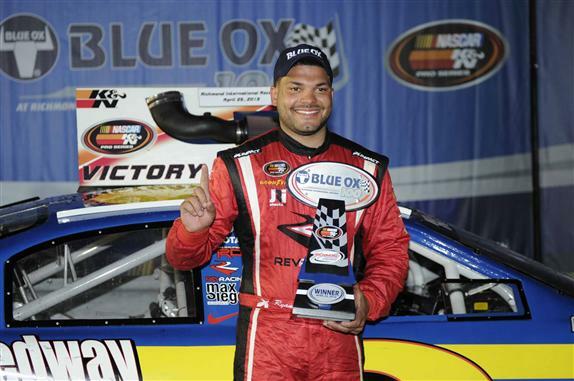 The 24-year-old Gifford earned his first victory in the K&N Series this April at Richmond where he won the Blue Ox 100. Heading into Iowa, he has four top fives, five top 10s and sits fourth in the K&N East standings. The Tennessee native has spent time around the Dillon family, racing Dirt Late Models for Team Dillon Racing. Gifford said even though Austin and Ty Dillon are “almost like complete opposites” behind the wheel, he tries to emulate the driving styles of both brothers. Gifford said he thinks an important trait in a racecar driver is being able to adapt to different situations. That adaptability will be key as he switches from K&N car to Nationwide car for qualifying, practice and the races at Iowa Speedway. How excited is Gifford about the upcoming race weekend?